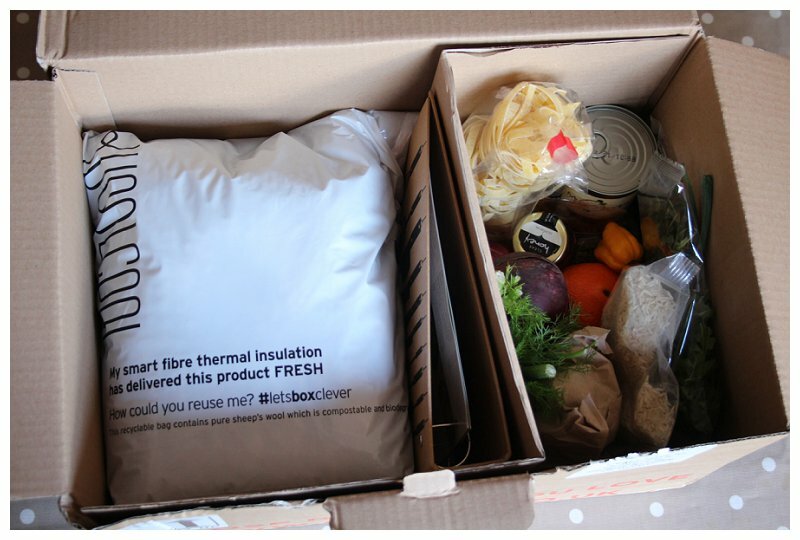 Before our holiday the kind people at Gousto sent us a food box to try*. Now if you know Jim and I you'll know that we love food, and that he's the chef in our house, so whilst we were both excited to see what was in the box - I think he might have been more excited by the contents. As we unpacked the box we were met with 3 compartments, one containing all the fresh, tinned and dry ingredients we needed, a cute little recipe binder that you add to as you order more boxes and an insulated bag filled with the perishables. The bag was filled with a sheep's wool that is compost able so went straight in to the neighbours compost bin once the meat was in the fridge. The boxes say the contain everything you need to make meals for either 2 or 4 people for 3 days at a time - and we were pretty pleasantly surprised to find that it did. So often these things require you to add bits, but every thing was included - I think we might have needed to add a drop of oil to the pan but that was it!! 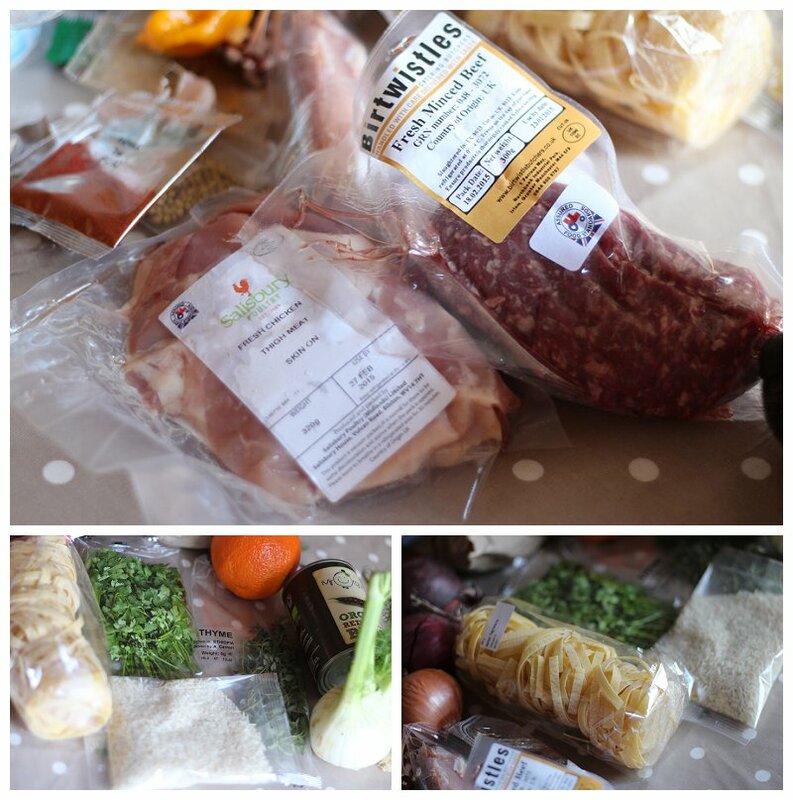 Our box contained the ingredients to make a Sicilian Pork Bake, Jerk Chicken with Rice and Beef Stroganoff. 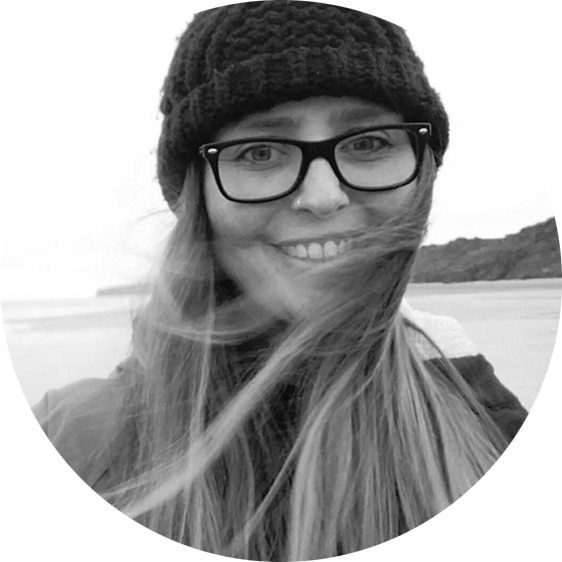 We started with the Stroganoff - one because it was the quickest to make and it was late on a Friday night and we'd just got home from work, and two because we really fancied pasta. The joke in our house is that Jim can take 3 hours to make beans on toast so it was really interesting (read amazing) to see that it took him pretty much the specified half an hour that the recipe suggests it will. Now, I failed massively as a blogger as I didn't take any pictures of the finished meals because, and I wont lie about this, because I was just hungry and wanted to eat. But the stroganoff was delicious. But disapointingly made in the kitchen with nothing flambéed at the table. Our next meal was the Jerk Chicken - As I am a complete spice wimp mine was a version without any chilli in it, but Jim relished in the chance to add a bit of the scotch bonnet that came with the recipe to his portion. The chicken was lovely but my favourite was the rice - it contained kidney beans and cinnamon - something I'd never have thought of adding but really really enjoyed! 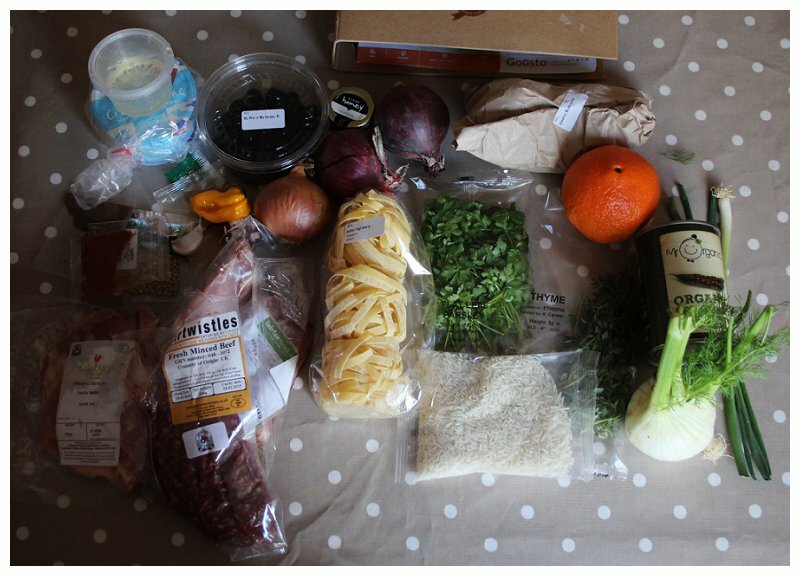 And then our last meal was the Sicilian Pork traybake. Unfortunately I am apparently a fussy eater and I'm not a fan of fennel or olives, and as these are main components of the dish after the pork, this wasn't my favourite - I basically just just ate the pork - but Jim loved it so what do I know? 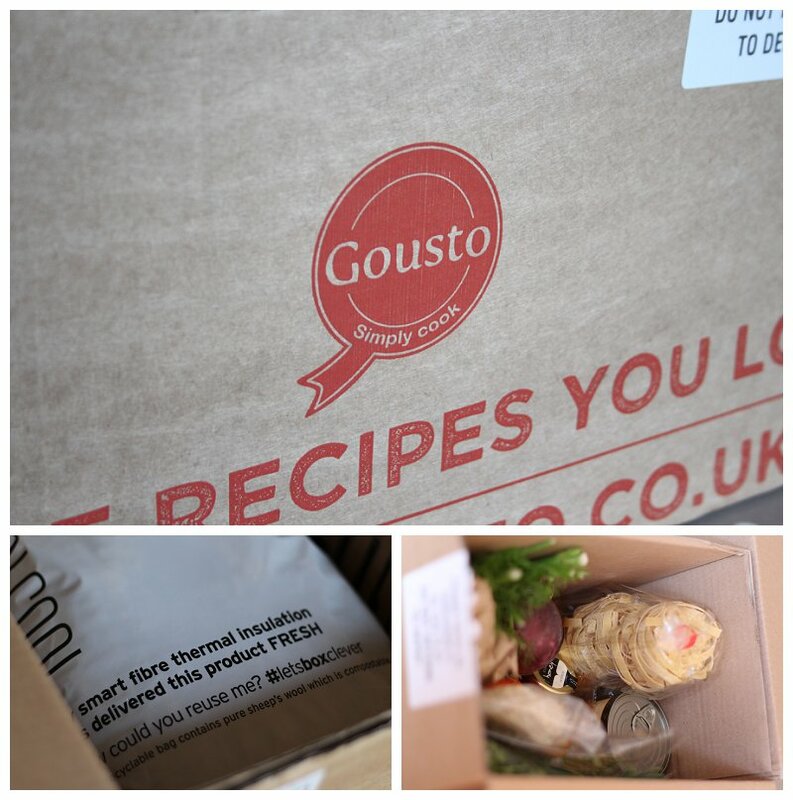 So all in all we had a great weekend sampling the Gousto box. I'll be honest I'm not sure that it's something we'd do every week as we're rarely in together for 3 full meals as we're both usually rushing off to somewhere in the evening but it's certainly something that we'll be ordering again - probably for a weekend -especially as I've had a look through the recipes available and I really want to try the Fish Burger and the Panzella Salad! 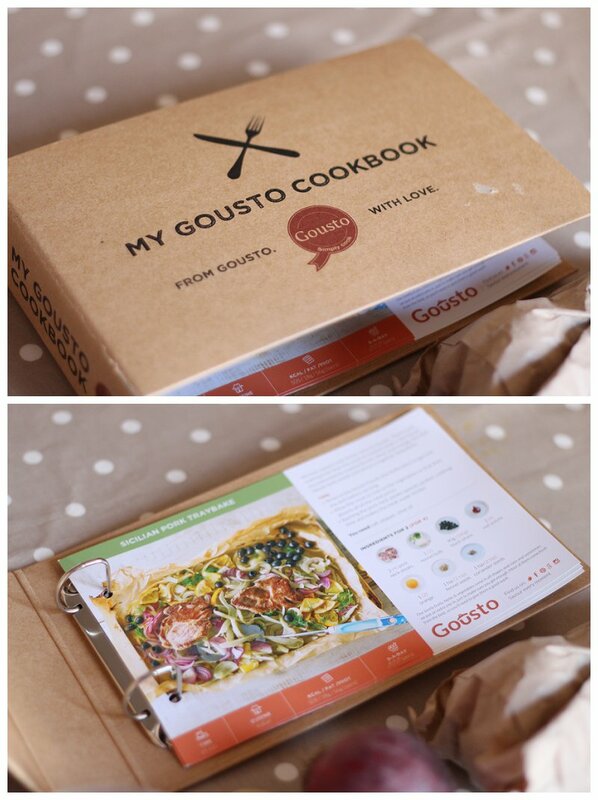 If you want to give Gousto a go - pop over to www.gousto.co.uk and use the code OHGOSH for a lovely little discount! *We were sent the box for free but not paid for the review. 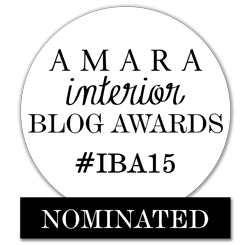 Oh that looks good and I think the pork and fennel traybake would probably be my favourite of the bunch!